I know the word “stuff” sounds like another word for junk, but it truly isn’t. Anyone who has gone through the “stuff” left by a parent knows there are giant memories hidden in what others call junk. Ridding yourself of that accumulated stuff shouldn’t be taken lightly or rushed through. It will be difficult. It will take a toll on your time, energy and emotions. Give yourself plenty of margin during the process. For Larry, it was the disbelief that he had accumulated so many things over the years. How did that happen? An 800 square foot building and a two car garage were filled with valuable and not so valuable things needing to find a new home before our house sold. And then there was the anxious feeling that what he got rid of today, he might need down the road (literally). How can you decide what to save for your RV when you’ve never lived in one? He had worked long days and many years to afford all those things, and now he’s mostly giving them away. Not only that, but it’s physically demanding and time-consuming to sort and get rid of that much stuff! As for me, having had the experience of sorting through my father’s things after his death and twelve years later sorting through the things my mother left after her death, gave me a clear picture of what I was facing when I started ridding myself of my things. Or so I thought. I was two days into having a second go around to lighten the load when I was confronted by two episodes that changed a downsizing session into another creature altogether. I’m holding a clay fish in my hand, and I remember my older son bringing it home from his high school art class. He wasn’t impressed with his art and was surprised I wanted to keep some of it. 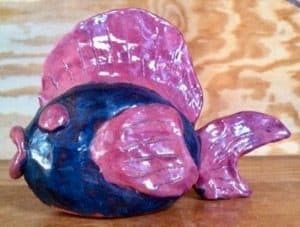 The box with a lid and a bulbous looking jar had already made it to the trash, but the fish had stayed on the shelf where his proud momma had put it. Now, I found myself looking at it, knowing it would not be a good fit for the RV. It needed to go. Other memorabilia could be stored for family members to have when I’m gone, but no one but me would understand why a bulky fish was in the keepsake box. So I relived the memory of the day the fish arrived and then I tossed the fish into the trash and went on to the next item. But I couldn’t go on. I knew my heart wasn’t finished with the fish. I dug it out of the trash, looked it over one more time and put it back on the shelf. It would have to be dealt with another day. With my heart still tender over the silly fish, I pulled out a ziplock bag of 25th wedding anniversary cards given to us by family and friends who celebrated our milestone with us. What I found in the innocent looking bag was a heart-stirring run through eleven years of my family’s tragedies and joys. One card was from a dad, mom, their daughter and son. Their son is no longer with us. We lost him to a fiery car wreck and now I know my downsizing session is crashing into the tangible items that are my memories. Reading on through another sentimental card I see my sister-in-law’s name and her husband’s name, and I remember his last valiant nine-month struggle with cancer. The final kick to the heart is the card from my mother who died the year before. And I did. I cried and I sniffled but then I got back to my task of sorting. That bag of cards went into my memorabilia box for possible digital scanning so I can have the cards with me in the RV. As for the fish, it was later photographed and thrown away. When you’re downsizing you’re going to have moments of feeling anxious, overwhelmed and emotional. My advice is to be gentle with yourself, but do ask the difficult questions and answer them honestly. Do I need this in the RV? Have I ever used this item, like I thought I would? Can I rent or borrow one if I need one later? Can this be easily replaced? Is this irreplaceable because of the memories it holds? As for me and Larry, we still have items stored in a family member’s spare bedroom. There are things like photos, VHS tapes, extra fishing, diving gear, dvds and a few old clothes. We get rid of a little bit each time we’re in the area. Who knows when we’ll be rid of it all? I can’t agree with anyone who says our things are just stuff unless they can also acknowledge the connection that much of our stuff has to who we are and who we were and how far we have come. However, please, please don’t decide that your “stuff” is worth giving up your dreams for. Push through the intense sorting and disbursing of all those things. Push through the emotions, even if you need to take breaks. Adventure is calling and the clock is ticking. Love this. Your last line says it all. As a ’50s child my gen accumulates stuff like crazy! I could write a post about it! Great topic and ideas on how to deal with downsizing and what to keep. Thanks, Susan. A friend downsized to the equivalent of a car full of items. He told everyone how freeing it was. Once we downsized, we saw it was true! Until you do it, you can’t imagine how light it feels. Thank you for this story. I am doing this now and I appreciate the encouraging words. “What is really important?” I keep asking myself. Moving forward takes leaving where you are sitting. Good with your blog. Moving forward takes leaving where you are sitting. I like that! You can’t change without change, for sure. I helped my mother do some decluttering before she passed away and when she’d hesitate over some item I’d ask her, “Is there someone who could use this more than you?” “Would you be helping someone by passing this along?” Decluttering takes a big mind shift!